The legend begins with Philoneicus, a Thessalian, bringing a wild horse to Philip for him to buy. None of the hands were able to handle it, and Philip turned very upset at Philoneicus for bringing such an unstable horse to him. Alexander apparently noticed that the horse had been shying away from its own shadow, and so he led it gently into the sun, so that its shadow was behind it, all the while stroking it gently and whispering into its ear. 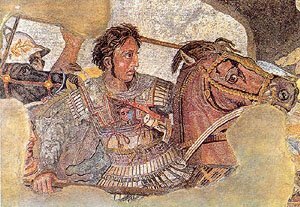 Eventually the horse let Alexander mount him, and Alexander was able to show his equestrian skill to his father and all who were watching. "Mosaic - Alexander and Bucephalus in battle"
Alexander named the horse Bucephalus, which means Ox head, and this horse has walk all over Alexander's war routes. He ride it across Europe in his fatherland, Asia and Africa, founding a city in its honor in India after its death.